Our annual Barrio Fiesta brings together over 250 attorneys, judges and community leaders to celebrate the year's achievements and to recognize individuals and organizations who have contributed significantly to our communities. This is also the premier fundraising event for the FLOW Foundation, which provides monetary scholarships to local law students. In keeping with our tradition, we will be transforming the Filipino Community Center into a magical venue for our Barrio Fiesta. Of course, the evening will feature an authentic Filipino buffet, cultural presentations, dancing, and highlights from our last ten years. This is the most unique, entertaining, and fun-filled minority bar event, bringing together attorneys, judges, and community leaders to have a good time and to celebrate FLOW’s achievements. We are proud to announce this year’s keynote speaker and founding FLOW member, the Honorable Benes Z. Aldana [Ret.]. Captain Aldana is the first Asian Pacific American to serve as chief trial judge in U.S. military history. In addition to serving his country, Captain Aldana is a vocal advocate for the Asian Pacific American community, and in particular, the Filipino community. Benes Z. Aldana became the 9th president and chief executive officer of The National Judicial College in 2017. Before that, he was on active duty in the U.S. Coast Guard for over 22 years serving in multiple leadership positions. He retired in the rank of captain and was the first Asian Pacific American to serve as a chief trial judge in U.S. military history. Prior to that, he served as the chief legal officer for the 8th Coast Guard District in New Orleans, Louisiana, overseeing legal advice to Coast Guard operations spanning 26 states and the Gulf of Mexico. He was first appointed a military trial judge in 2005 and as an appellate judge in 2015. Other notable assignments as a Coast Guard judge advocate included: chief counsel, Legal Engagements Division, U.S. Africa Command in Stuttgart, Germany; deputy staff judge advocate, 13th Coast Guard District; special assistant U.S. attorney for the Western District of Washington; trial attorney at the Department of Justice, Environment and Natural Resources Division; legal advisor to the Department of Defense Criminal Investigation Task Force, Guantanamo Bay, Cuba; deputy chief, Office of Environmental Law, U.S. Coast Guard; and appellate and trial counsel. He also served as the commanding officer, personnel services and support unit, Seattle, and executive officer for Coast Guard Base Seattle. He currently serves as the President of the NAPABA Judicial Council. 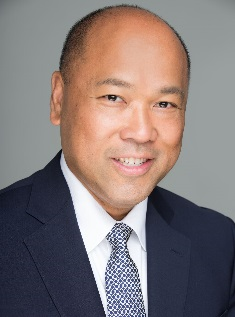 He served as 2009 president of the Asian Bar Association of Washington. Although he grew up in the Seattle area, graduating from Seattle University and University of Washington School of Law, his career has taken him around the world. He served as 2012-2013 chair of the American Bar Association Solo, Small Firm, and General Practice Division, and has served on various ABA standing committees and commissions including the ABA Rule of Law Initiative and ABA Commission on Racial and Ethnic Diversity in the Profession. He was a founding board member of the Filipino Lawyers of Washington (FLOW) and the Filipino American Lawyers Association of Washington, DC (FALA DC). His military awards include the Defense Meritorious Service Medal, two Coast Guard Meritorious Service Medals, four Coast Guard Commendation Medals, the Army Commendation Medal, two Coast Guard Achievement Medals, and two Commandant’s Letters of Commendation, as well as various team and unit awards. Non-military awards include the DHS General Counsel’s Award of Excellence, the NAPABA Daniel Inouye Trailblazer Award, ABAW Judge of the Year, ABA Outstanding Young Military Lawyer Award, NAPABA's "Best Lawyer Under 40,” and the American Bar Foundation Fellows Outstanding Chair Award. FLOW is very proud and honored to have Hon. Aldana come home to Seattle to speak at this year's Barrio Fiesta! As part of the annual Barrio Fiesta, the Filipino Lawyers of Washington (“FLOW”), through the FLOW Foundation, awards up to three scholarships ranging from $500 to $3,000 to law students in the Pacific Northwest. The scholarships are intended to recognize law students who have demonstrated significant commitment to community service, particularly service to the Filipino/Filipino-American community. You need not be of Filipino ethnicity to apply. For information about the Pangarap Scholarship and to donate to the FLOW Foundation, click here. Please send any questions related to the Barrio Fiesta to fiesta@filipinolawyers.org. Purchase your 2018 FLOW Barrio Fiesta Tickets now!!! Advance payment can be conveniently made online via PayPal. NOTE: Student pricing is $50 before September 30th and $65 thereafter. Must show valid student ID. Tickets at the door on the day of the event will be $100 per person. In addition to the individual ticket options listed below, we are offering a variety of Premium Table sponsorship levels for purchase (includes Premium Table Seating, as indicated). For more information about our sponsorship levels, please download our Sponsor packet here. *If you would like to donate an amount different than provided in the drop-down menu above, please download our Sponsor packet here and submit a check as directed on the Sponsorship Commitment Form therein. NOTE: Clicking on the "Add to Cart" button will bring you to a PayPal checkout web page. In order to add multiple items to your cart, select "Continue Shopping" on the PayPal page and add your additional selections here by selecting the additional item(s) and again clicking on the "Add to Cart" button to send you back to the PayPal page. Individual tickets and Sponsorships are processed via separate PayPal invoices. You do not need to have a PayPal account in order to purchase tickets. Barrio Fiesta 2018 ticket sales and sponsorship monies go to support the FLOW Foundation, a 501(c)3 organization. Payments are tax deductible as a charitable contribution to the extent it exceeds the fair market value of goods and services provided in consideration for the contribution. Please also consider joining FLOW today! Sign up as a member today to take advantage of the FLOW Member Fiesta rate, as well as all the other benefits of FLOW Membership. Membership can be conveniently purchased online by clicking here. For any questions related to the online purchase of tickets or membership, please contact webmaster@filipinolawyers.org.